Cannondale make beautiful bikes – in recent years they’ve taken a bit of a dip, as they’ve tried to be more mainstream in the design. But the early bikes had wonderful large tube frame sets and my R700 was one the last aluminium frames in that early mindset before they shifted towards carbon frames (such as the Synapse and SuperSix). The R700 didn’t shift to the trend then for sloping top tubes and retain a traditional design, but that’s not proved to be a comfort issue. To be fair, I did replace the original stem for a shorter version with a bit more ‘lift’ to it, as the stock item was made for a lower, more stretched, position. Other than that tweak the bike has been pretty much unchanged. When I bought it from John’s Bikes in Bath, I swapped the saddle for a Selle Italia Gel Flow, which has proven to be the most comfortable saddle ever. I did dabble with a Brookes Swift for a season, but while that was never uncomfortable, it never quite the same positive feel as the Selle Italia. I bought the Cannondale originally to help get some extra miles under my legs, as most of my riding was off-road, and I’d set myself the traget of the Malmesbury Triathlon later that year – which also meant I needed a faster bike. The Synapse had just come on the market, but it didn’t quite tick the right ‘style’ boxes for me, especially at the R700 came in a wonderful retro orange colour. Not to mention that initial impressions, given that this was the first road bike that I’d ridden in about twenty years, were of a comfortable, well put together, bike. Since then the Cannondale has survived the regular 1-2 hour weekend rides, through all seasons. It’s been on several extended rides, the best of which was the short tour around the Western Pyrenees – if you have a race bike and you’ve grown up with the Tour, then you have to get a couple of those classic under your belt. I did swap the FSA race chainset for a compact Shimano 105 set before heading to the Pyrenees, and I’ve very glad I did so. 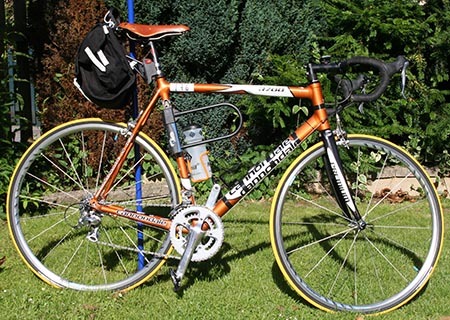 The picture above was the R700 just before we headed to the Pyrenees, so it lost some of the streamlined racing pedigree as I loaded it with a Carradice saddlebag, bar bag and U-lock. Still it proved to be a versatile workhorse and still showed it’s composure as we heading back down the mountains. Overall, the R700 has proved to be very reliable, none of the main components have given any issues. However, during 2013 I had to replace the original Shimano R501 wheels when the rear wheel broke a spoke and sourcing a replacement was proving to be difficult, and the subsequent rejigging of the wheel (bearing in mind that I have built MTB wheels from scratch) was looking to be difficult to say the least. So rather than try fixing a wheel that was obviously heading for more failures, I picked up some Shimano RS30’s just ahead of the winter – Shimano RS80’s would have been nice, but the RS30’s will be a better winter wheel. The only other area that’s changed has been the tyres – I’ve recently installed Continental Gatorskins [January 2014], as I’m hoping to get more rides in during the winter months, but my tyre of choice for the main three season have been Vittoria Rubino Pro’s. Score out of ten for the Cannondale R700 – NINE. Your R700 bike looks really impressive. Cannondale does create some very good bikes.